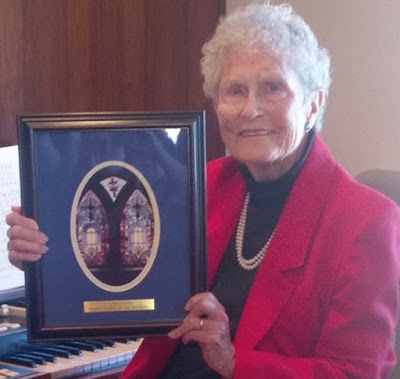 Wanda Brent, Arrriba, was recognized Sunday, March 27, 2016 for serving as church organist for over 60 years at Bethel Church of the Brethren, 9 miles north of Arriba. An "In Appreciation" framed picture of the church's stained glass window was presented to her. Wanda continues as organist each Sunday when good health and weather permit.